This testimonial for Monitored IP CCTV System has just come in. This is a very large site with Intruder Alarm, Fire Alarm, Gas Suppression and Access Control. 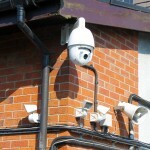 The latest addition is a remotely monitored IP CCTV system. Well done guys, it’s always a pleasure to hear from delighted customers. Could we help to improve your safety and security too? ESI install CCTV, Intruder Alarms, Access Control, Fire Alarms and Gas Suppression systems to commercial sites in the North West. Call us on 01663 719520 or 0800 082 5500 for a free, no obligation site survey and quote.